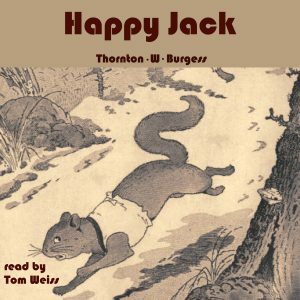 Happy Jack is a grey squirrel who lives in the Green Forest. Like most little creatures, he must fend for himself. Happy Jack has discovered a tree that chocked full of hickory nuts. He wants them to be all his own and believes the tree is his because he found the nuts. But his cousin Chatterer the Red Squirrel doesn’t believe this. A loud quarrel ensures between the two along with a chase and suddenly the hickory nuts are gone! Where could they have gone? As with all Thornton Burgess books, young listeners are taught valuable lessons about nature and positive virtues of life.